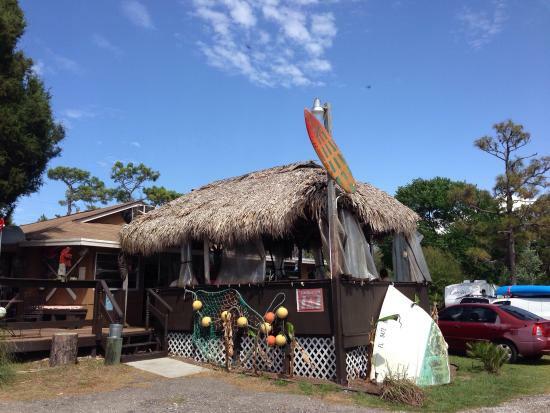 Dan’s Clam Stand, Crystal River FL, looks a little like an RV stop (there actually is an RV park next to it) but don’t judge a book by its cover; this place is a diamond in the rough. My first glance of this clam shack brought me right back to my childhood when on special nights my family and I would pile into the station wagon with paneling on the outside and rumble seats in the back. On the way to Kelly's Roast Beef, just north of Boston I'd always mull over my options but inevitably, I always came back to my all-time favorite; whole belly clams and tartar sauce. As a family we'd order all of our food at the window then cross the street to sit on the wall at Revere Beach listening to the waves crash, eating our seafood and chatting about random things. Clam strips are pretty common, but they are only one muscle of the clam and tend to be rubbery and chewy. A whole belly clam is the entire creature dipped in batter and deep fried. The muscles are slightly chewy, but the belly of the clam is smooth, creamy, sweet and delicious. This combined with the light crunch of Dan's batter and a dip in tartar sauce creates a wonderful flavor and texture explosion in your mouth! After working up an appetite swimming with manatees, swing by Dan's! If you’re not a fan of whole belly clams you can always try the lobster roll or his genuine New England clam chowder. No matter what you eat, Dan’s Clam Stand is a taste of New England and for some of us a step back in time to simpler days before cell phones and social media spending quality time with the family watching the gentle ocean waves as the light of day faded into evening. Older PostWhat Is Florida Red Tide?